1. Stand in a relaxed posture. with your feet close together, spine straight and arms at side. Gracefully bring your hands up to touch chest, palms facing outward. 2. Slowly straighten arms outward at chest level. Feel elbows stretching. 3. Slowly bring arms behind you. Keep them high at shoulder. Feel shoulders stretching. Lower arms slightly so that fingers can be interlaced. Do not bend trunk at this point. 4. Very slowly and gently bend backward a little. Don’t overdo it the first time. Keep arms high, look upwards. Hold for 10 counts. 5. Very slowly and gently bend forward. 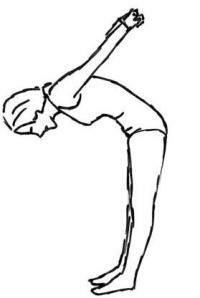 Keep neck muscles relaxed; point forehead towards knees. Do not bend knees. Feel spine stretching gently. Hold for 20 counts. Slowly straighten to upright position. Relax, then proceed to next exercise. For a simple yoga exercise to strengthen the back, click here.